Duke Ellington has a Message for Dressage Riders. It goes without saying that Duke Ellington is right, about most everything. And even horses agree. Then it happens- an intrusive thought enters your peaceful brain, or maybe your trainer suggests something relatively simple, like a leg yield. Screech! Have you ever noticed that there is some mutually exclusive clause, signed and dated, between your brain and your seat? It’s like they have agreed that they simply can not work simultaneously. The instant a thought enters your mind, your seat stops working. That’s the seat cueing the horse to stop but since your brain is spinning, you don’t notice. So, you kick and ask for more forward, maybe pull on a rein as well. It’s confusing to the horse- stop or go, what do you want? And now move laterally? Can you say pretzel? It seems there is a period of time when we may ride, or we may think, but not both together. Advanced riders solve this dilemma by learning to rub their belly while patting their head. Really advanced riders can demonstrate it in public. Learning something new isn’t always graceful, and sometimes in an effort to accomplish an more advanced movement, the rest of our riding will seem to fall apart. Rhythm (or the lack of it) is contagious. It doesn’t matter if the tension starts with the horse or the rider, it doesn’t matter if there is a good reason behind it… We can get stuck in the awkwardness of a mind/body disconnect, and our horse comes along for the ride. Forward and relaxed is the answer, and finding rhythm is the way back to harmony in the saddle. Most horses look to their rider for the key to rhythm. But be honest- how many of us really have much rhythm at all? Especially if our horse has responded to our frustrated learning process with tension and resistance. Relaxation is the basis of the Dressage Training Pyramid, and all good rides. 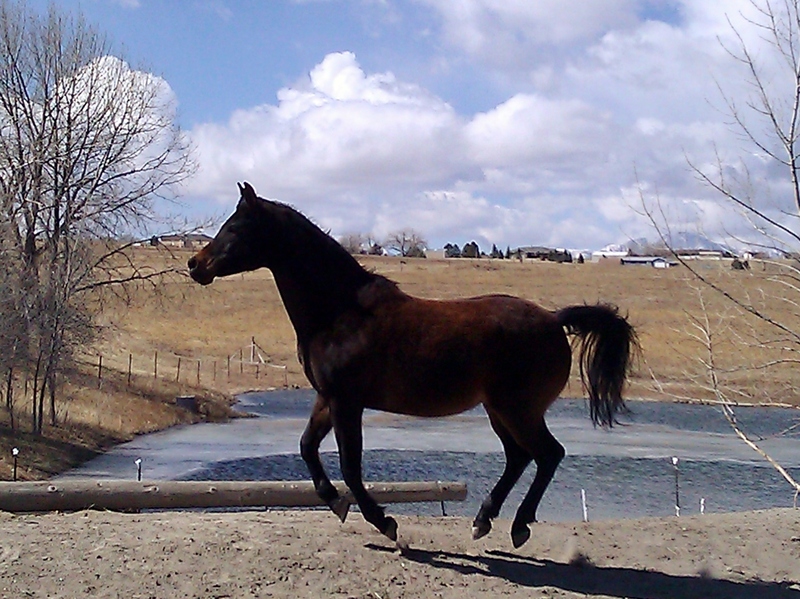 An understanding of horse behavior underscores the importance of rhythm (read here). Horses love music and will fall into rhythm, tempo, and a naturally correct way of going. Music has the ability to reconnect a rider too. It can allow the thinking to ease up and the body to re-engage. Music that gives us happy feet- can give a rider a happy seat, and a happy seat translates to a happy horse. I’ve always used music in my training and lessons to some degree, but in the last few months, I have gotten serious about it. I schlep a heavy, awkward boom box to each lesson. Then I teach while constantly making sure my client can hear me over the music. And it’s really worth the extra effort on my part- the process of learning, for both horse and rider, really does seem much lighter. Good lessons feel like performance art, and in a hard lesson, it is easier to dance it off with music. I brag that my riding playlist has the very best and most diverse music, collected over years of listening to what horses like. They tend to be a bit more open minded than humans. Current horse favorites are Lady GaGa, George Thorogood, and of course, Duke Ellington. Just give that rhythm- Everything you’ve got. None of this really fills the need for a horse in my life but it’s best for all for now that I resist all the offers of “free” horses. I can draw on my imagination, and hear the music. Love your comment- knowing the music of creativity, or another soul- it is a special, non-possessive place. I love this post! (Great comments too!) This gives me lots to think about! Now all you need is that saddle pad with speakers in the back to tie in your iPod to. Thank you so much for stopping by my blog and subscribing. I look forward to sharing more of my world with you. Got the pad, and I look forward to more from you as well. Now I’m jealous ! I keep wanting one but haven’t seen one for sale for some time now. I loved the post you had from your horse. Really funny! I wanted to let you know that I truly enjoy your blog and have nominated you for the ABC – Awesome Blog Content Award.